Tintinabulation. – Dirty wet dog , boats and sailing. Topsham 2 : the bells….the bells ! WABI”’ is now in her temporary mud berth well on the inside of the little marina at Trout’s boatyard in Topsham. As far as i can see she will only float for some tides and almost certainly not at neaps : later in the year Mark (boss) is going to move me into a finger pontoon so that i can get in and out more easily. 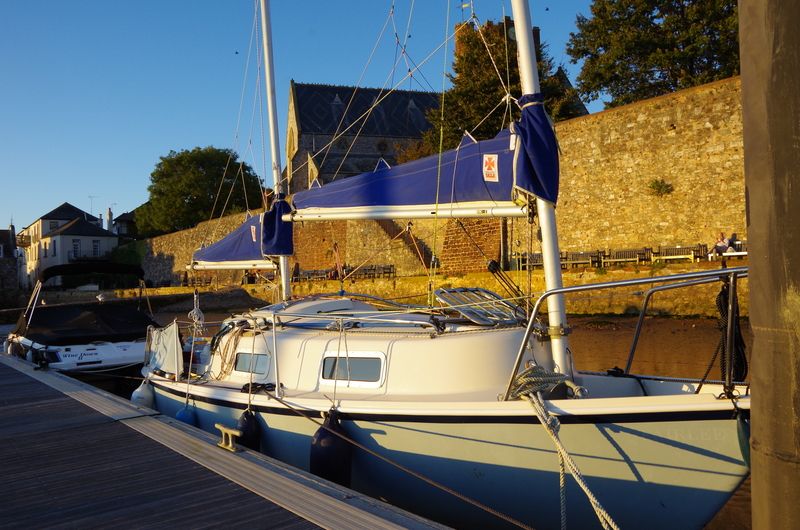 Currently what i will have to do is come out of that berth near to a high water spring and go out to a mooring as and when i want to go sailing in the Exe and then come back in at another high water….got some working out to do to plan the Autumn cruising. Now i can’t say that i hadn’t noticed the big church behind the boat but what i didn’t realise is that they really like ringing their bells !…..maybe it was a one-off or maybe it was their practice night but that last night they had a right old noisy session. Every time i thought “that must be it now” they would have a quick break and then off they went again until they came to a final jangling climax (ooh-er) just before 2100 and ringing just one bell to tell us that it was 9 o-clock and time for them to go home. Today i had a walk up the river as far as the other boatyard and where the M5 crosses the river and a wander around the village itself. I can’t say that the other boatyard was particularly friendly and they want to charge a ridiculous amount to lift WABI”’ for a scrub/antifoul and re-launch so when i need to do it i won’t be doing it there. As you would expect i had a good look at the boats on the river as its definitely a small boat kind of place : i may have mentioned earlier that there is a strong Devon Yawl fleet here and the class has its own ‘captain’ at the sailing club. This little gaffer caught my eye although i have to admit that i wouldn’t want a mooring as close to the motorway as that. There are moorings right up to the bridge and a few beyond but that’s as far as i explored today. One feature i did notice is that the playing field seems to have an adult exercise course with useful stuff like dip bars and the like , i haven’t seen one of those for years still in use. The village itself is a really quirky but attractive place with some nice looking (expensive) shops, little lanes and alleyways and a really odd mixture of styles and ages of buildings. There isn’t one cohesive style in the older buildings like say there is further down in the west-country where many are built from the local stone….rather some are brick, some wood clad and painted. I must say that i definitely like it. Very good coffee shop ! Just next to the town quay is an east coast barge being rebuilt which looks like a big project . There was nobody around that i could talk to today. Some time if i can get some history and some details it will make a great blog feature : for now all that i know is that the barge is called Vigilant, she was a working barge and then a houseboat and is being turned back into a barge again. I can’t say that i did very much today except that i took some time to sit and work up a new defects and ommissions list of essential jobs : i did a couple of useful jobs and went and spent some cash on a new chart of the river and a new longer bow-line. For now i am happy that i have escaped Plymouth again and that the boat is somewhere that i think i will enjoy : i can well imagine having WABI” in this area for the autumn and winter as the estuary and river will be partially sheltered from the open sea and it should be a nice place just to go and stay aboard. Topsham isn’t that far away and not that long a drive, its definiteley a shorter drive than was getting to Falmouth . I think i will be staying here until next spring when i will wait for better conditions to leave and sprint across Lyme bay and the next section of the voyage which i envisage as being Weymouth-Poole-Soylent-Chichester next year. Looks like a very good winter spot how much further can you get up above the motorway bridge ? which reminds me of a night spent under the Auckland motor way bridge over the Mangere inlet when we where doing a job there with the RIB noisy or what ! I had a walk upriver yesterday and saw one bilge keeler on the mud after the bridge so there is both reasonable air draught and enough water to get that far. There seems to be a walking route up to Exeter on the opposite bank and there is a ferry across the river to the canal which is just inside the other bank. I can imagine the noise if the M5 is anything to go on. Quite a lot of Dutch influence in the architecture around the old parts. Nice place. Salutation Inn worth a visit. Also one of the Franklin ships “Terror” was built in Topsham. Final bit, Topsham has second largest fleet of Devon Yawls next to that of the Yealm. Its a nice place. Must admit that i haven’t been able to place or date the older buildings some of which have a very formal look. We did notice the Yawl fleet and while i was in the clubhouse did note that they have a Yawl captain. Vigilant…is the barge being refitted there : haven’t had a chance to speak with the bloke working on her.